I’m so happy to announce the publication of my new book! 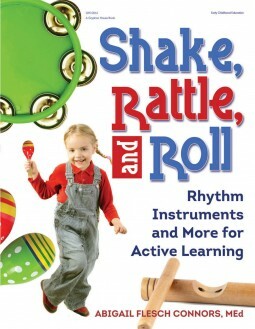 Music and movement go together like books and reading—they spread joy! It’s no secret that quiet doesn’t always equal quality learning. At times, we struggle to help children settle down so they can listen and learn. However, we can also encourage them to move to the beat so they can listen and learn in more active ways. Language—Repetitive songs help develop oral language and early literacy. Math—Music involves fractions, ratios, patterns, and proportions. Science—Activities involve acoustics, volume, velocity, mass, and force. Music—Children explore culture, imagine different environments, and express themselves while playing songs and singing along. This entry was posted in Creative Thinking, Music and Movement, Musical Games, Rhythm Instruments, Songs, Spanish songs and stories and tagged Abigail Flesch Connors, action songs, children and creativity, early childhod music, music and movement, preschool music, rhythm instruments. Bookmark the permalink. « Did You Say Infants?